Now, as you’ve probably already surmised, the protagonist in that prison movie was, in fact, me grunting and groaning my way through the 150 cumulative pull ups in the Base + Back routine. When Eileen told me that little story, I had to laugh. It’s true, I do get noisy at times as I struggle with my self-imposed demands in these various workouts. I’m also from New York, so let’s just say I have a rich vocabulary at my disposal. And I’ve been know to employ it, loudly, shouting expletives at Tony Horton or Shaun T as I finish a particularly taxing effort. Yeah, that’s right, I’m alone in the basement working out and, from time to time, I curse at the TV. With conviction. So yes, my friends, it’s not all roses and unicorns here. But it is hard to take yourself too seriously when you’re talking to the TV set. I’m now into Week 8 and my second Recovery period. 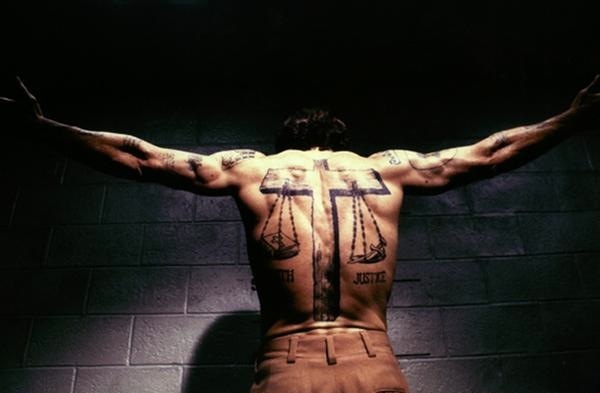 This entry was posted in P90X/X2 Hybrid, Round 7 and tagged Ab Ripper X, Balance & Power, Base + Back, Cape Fear, Kenpo X, Prison Movie, Rest, Robert De Niro, Sound, Tattoo. Bookmark the permalink.